The Languedoc has a long history, complicated by the fact that its name has changed several times, as have its borders, sometimes radically. The region was settled by Celts, with a Greek colony at what is now Marseille. It started taking form under the Romans as their first province outside Italy, Provincia Gallia Narbonensis. In the fifth century as the Roman Empire fell apart this province was ceded to the Visigoths as Visigothic Septimania (aka Gallia or Narbonensis). Due to Burgundian incursions it shrank to become the Kingdom of Narbonne and later expanded again as the Gothic province of Gallia. In the eighth century it was over-run by Moors and became Moorish Septimania an outpost of al-Andalus. Later in the same century it was again overrun, this time by the Franks, now becoming Carolingian Gothia. As Frankish influence waned, the area became identified as the County of Toulouse, an independent state, sharing a common culture with a broader area known as Languedoc or Occitania, both names preferring to Occitan, the common language of the area. After it was annexed to France in 1272, the County of Toulouse became a province of the Kingdom of France. Known as the Province of the Languedoc. 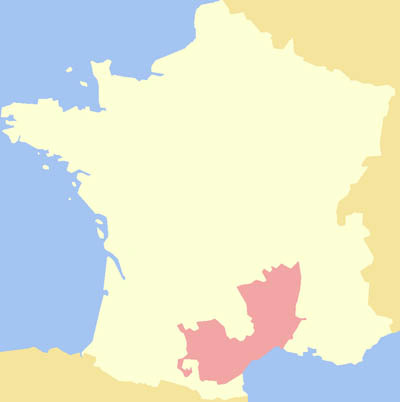 After the revolution in 1789 the province of the Languedoc was divided into two, the eastern part being having the Roussillon attached to it, and being known as the Languedoc-Roussillon region. Gaul. The area (corresponding roughly the modern Languedoc and Provence) was part of Gaul occupied by Celts, with a Greek colony at what is now Marseille. Provincia Gallia Narbonensis. The Romans founded a colony (Provincia Gallia Narbonensis) in BC 123 covering an area roughly corresponding to the modern Languedoc and modern Provence. Septimania. The western region of the Roman province of Gallia Narbonensis passed under the control of the Visigoths in 462 and was ceded to their king, Theodoric II. This area was known as Septimania. Kingdom of Narbonne. As the area fragmented under assaults from the King of Bugundy, the Goths established a Kingdom of Narbonne. Gothic province of Gallia. The area became a province of the Visigothic Kingdom centred in Iberia. Moorish Septimania. The Moors, under Al-Samh ibn Malik the governor-general of al-Andalus, sweeping up the Iberian peninsula, by 719 overran Septimania. Carolingian Gothia (8th century). When the Franks overran the area they called it Gothia after the reign of Charlemagne. , referring to the previous rulers. County of Toulouse. As Frankish power diminished, a number of independent states were established in the area. Languedoc & Occitania. These terms were used to denote an area with a distinct culture, stretching across what is now southern France, of which the County of Toulouse was the largest and central part. The Province of the Languedoc. After it was annexed to France in 1272, the County of Toulouse became a province of the Kingdom of France. The Languedoc-Roussillon. After the revolution in 1789 the province of the Languedoc was divided into two, the eastern part being having the Roussillon attached to it, and being known as the The Languedoc-Roussillon. The Provincia Gallia Narbonensis was a Province of the Roman Empire dating from 123 BC up until the 5th century. It was originally known as Gallia Transalpina (Transalpine Gaul), and informally by the Romans as as Provincia Nostra. 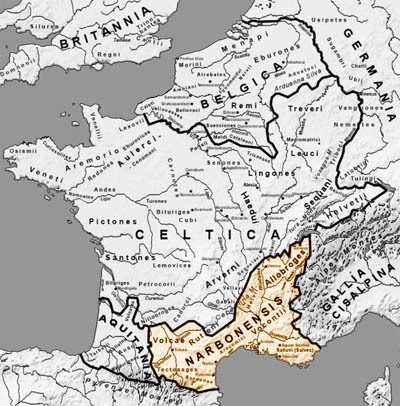 Gallia Narbonensis or in English Narbonese Gaul, named from the settlement at Narbonne, was the part of Gaul lying across the Alps from Italia. Its western region was known as Septimania. Gallia Narbonensis became a Roman province in the late 2nd century BCE, constituting the first significant Roman territory outside of Italy. Its boundaries were roughly defined by the Mediterranean Sea to the south and the Cévennes and Alps and north and west. The province of Gallia Transalpina (Transalpine Gaul) was renamed Gallia Narbonensis, after its capital the Roman colony of Narbo Martius (Narbonne, founded on the coast in 118 BCE. Romans called it Provincia Nostra ("our province") or simply Provincia ("the province"), as it was the first significant permanent conquest outside the Italian peninsula. The name has survived in the modern French name of Provence, now a région of France, corresponding to the Eastern part of Gallia Narbonensis. Already by the mid-2nd century BC, Rome had been trading heavily with the Greek colony of Massalia (modern Marseille) on the southern coast of Gaul. Massalia, founded by colonists from Phocaea, was by this time already centuries old and very prosperous. Rome entered into an alliance with Massalia, by which it agreed to protect the town from local Gauls and other threats, in exchange for a small strip of land that it wanted in order to build a road from Italy to Spain, to assist in troop transport. The Massalians cared more about economic prosperity than territorial integrity - they had no interest in empire building. It was from this strip that Transalpine Gaul was founded. On this strip of land the Romans founded the town of Narbonne, which was to become a major trading competitor with Massalia. The area became a Roman province in 121 BCE, originally under the name of Gallia Transalpina (Transalpine Gaul). This name distinguished it from Cisalpine Gaul, the part of Gaul on the near side of the Alps to Rome. Mediterranean settlements on the coast were threatened by the powerful Gallic tribes to the north, especially the tribes known as the Arverni and the Allobroges. In 123 BCE, the Roman general Quintus Fabius Maximus Allobrogicus campaigned in the area and defeated the Allobroges and the Arverni under king Bituitus. This defeat substantially weakened the Arverni and ensured the security of Gallia Narbonensis. It was from the capital of Narbonne that Julius Caesar began his Gallic Wars. Bordering Italy, control of the province provided the Roman state with significant benefits, control of the land route between Italy and the Iberian peninsula; a buffer against attacks on Italy by tribes from Gaul; and control of the lucrative trade routes of the Rhône valley, over which commercial goods flowed between Gaul and the trading centre of Massalia. At one point, Narbonese Gaul and Transalpine Gaul were governed as separate territories. When the Second Triumvirate was formed, Lepidus was given responsibility for Narbonese Gaul and Spain, while Mark Antony was given Cisalpine and Transalpine Gaul. Under Theodoric II, Visigoths settled in Aquitaine as foederati of the Western Roman Empire (450s). Visigoths were then holding the Toulousain - the Area around Toulouse. In 462 the Empire granted the Visigoths the western half of the province of Gallia Narbonensis to settle. In fact the Visigoths under King Theodoric II initially occupied the whole Provence (including eastern Narbonensis) in 462, but in 475 the Visigothic king, Euric, ceded the eastern Narbonensis to the Roman Empire by a treaty under which the emperor Julius Nepos recognised the Visigoths' full independence in respect of their other territories. Septimania was the western region of the Roman province of Gallia Narbonensis. Under the Visigoths it was known as Gallia or as Narbonensis. It corresponded roughly with the modern French region of Languedoc-Roussillon. The name "Septimania" may derive from part of the Roman name of the city of Béziers, Colonia Julia Septimanorum Beaterrae, which in turn alludes to the settlement of veterans of the Roman VII Legion in the city. 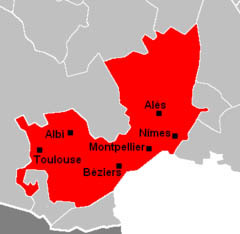 Another possible derivation of the name alludes to the seven cities (civitates) of the territory: Béziers, Elne, Agde, Narbonne, Lodève, Maguelonne, and Nîmes. Septimania extended to a line half-way between the Mediterranean Sea and the Garonne River in the northwest; in the east the Rhône separated it from Provence; and to the south its boundary was formed by the Pyrenees. As control of the area fragmented, the Visigoths maintained a kingdom centred on Narbonne, though they lost control of even their capital from time to time. The Visigoths, because they were Arian Christians, met opposition from the Catholic Franks in Gaul. The Franks allied with the Celtic Armorici, whose land was under threat from the Goths south of the Loire, and in 507 Clovis I, the Frankish king, invaded the Visigothic kingdom, whose capital was Toulouse. Clovis defeated the Visigoths at the Battle of Vouillé. The Goths' child-king Amalaric was carried away to safety in Iberia, while Gesalec was elected to replace him and rule the remaining Visigothic kingdom from Narbonne. Clovis, his son Theuderic I, and his Burgundian allies proceeded to conquer most of Gothic Gaul, including the Rouergue (507) and Toulouse itself (508). The attempt to take Carcassonne, a heavily fortified site guarding the Septimanian coast, was defeated by the Ostrogoths (508) and Septimania thereafter remained in Visigothic hands, though the Burgundians managed to take and hold Narbonne for a time and drive Gesalec into exile. Border warfare between Gallo-Roman bishops and other powerful nobles against the Visigoths had become common during the last phase of the Empire and this warfare continued under the Franks. Kings after Alaric II favoured Narbonne as a capital, but twice (in 511 and 531) were forced back to Barcelona by the Franks before Theudis moved the capital there permanently. The Ostrogothic king Theodoric the Great reconquered Narbonne from the Burgundians and re-established it as the provincial capital. When Theodoric died in 526, Amalaric was elected king in his own right and he immediately established his capital in Narbonne. He ceded Provence (which had again passed back into Visigothic control) to the Ostrogothic king Athalaric. The Frankish King of Paris, Childebert I, invaded Septimania in 531 and chased Amalaric back over the Pyrenees to Barcelona in response to pleas from his sister, Chrotilda, who claimed that Amalaric (her husband) had been mistreating her. The Franks did not try to hold the province, but raided it again in 541. Under Amalaric's successor the government of the kingdom crossed the Pyrenees , Theudis establishing his capital at Barcelona. Later the capital of the Visigothic kingdom moved further south to Toledo. By the end of the reign of Leovigild, the province of Gallia Narbonensis, usually shortened to just Gallia or Narbonensis (and not now called Septimania) was both an administrative province of the central royal government and an ecclesiastical province whose metropolitan was the Archbishop of Narbonne. The province of Gallia held a unique place in the Visigothic kingdom, as it was the only province outside of Iberia, north of the Pyrenees , and bordering a strong foreign tribe, the Franks. Under Theodoric Septimania had been safe from Frankish assault. When Liuva I succeeded the throne in 568, Septimania was a dangerous frontier province and Iberia was wracked by revolts. Liuva granted Iberia to his son Leovigild and kept Septimania to himself. During the revolt of Hermenegild (583-585) against his own father Leovigild, Septimania was invaded by Guntram, King of Burgundy, possibly in support of Hermenegild's revolt. A Frankish attack in 585 was repulsed by Hermenegild's brother Reccared, who was ruling Narbonensis as a sub-king. Hermenegild died at Tarragona that year and Reccared took Beaucaire (Ugernum) on the Rhône near Tarascon and Cabaret (now called Lastours), both of which then lay in Guntram's Burgundian kingdom. Guntram ignored pleas for a peace in 586, so Reccared undertook a Visigothic invasion of Francia. Guntram invaded Septimania again in 589 and was roundly defeated near Carcassonne by Claudius, Duke of Lusitania. Throughout the sixth century the Franks had coveted Septimania, but were unable to take it. The invasion of 589 was their last attempt. In the seventh century Gallia had its own governors or duces (dukes), who were typically Visigoths. Most public offices were also held by Goths, far out of proportion to their part of the population who throughout all this were descendants of the original Celts. The native population of Gallia was referred to by Visigothic and Iberian writers as "Gauls" and there is a well-attested hatred between Goths and Gauls. Gauls commonly insulted the Goths, though the Goths regarded themselves as the defenders and protectors of the Gauls. By the time of Wamba and Julian of Toledo a large Jewish population had grown up in Septimania. Thanks to the preserved canons of the Council of Narbonne of 590, something is known about surviving pagan practices in Visigothic Septimania. The Council may have been responding in part to the orders of the Third Council of Toledo, which found "the sacrilege of idolatry [to be] firmly implanted throughout almost the whole of Iberia and Septimania. The Roman pagan practice of not working Thursdays in honour of Jupiter was still prevalent. The council set down penance to be done for not working on Thursday (except for church festivals) and commanded the practice of rest from rural work on Sundays, to be adopted. The council also decreed punishment for fortune-tellers, who were to be publicly lashed before being sold into slavery. Visigothic coinage did not circulate in Gaul outside of Septimania and Frankish coinage did not circulate in Iberia or Septimania, which suggests little cross border trade. If there was a significant amount of commerce over the frontier, the coins paid must have been melted down and re-minted. The Moors, under Al-Samh ibn Malik the governor-general of al-Andalus, swept up the Iberian peninsula, and by 719 had overrun Septimania. Al-Andalus is also known as the Emirate of Córdoba. Al-Samh set up his capital from 720 at Narbonne, which the Moors called Arbuna, offering the still largely Arian Christian inhabitants generous terms and quickly pacifying the other cities. 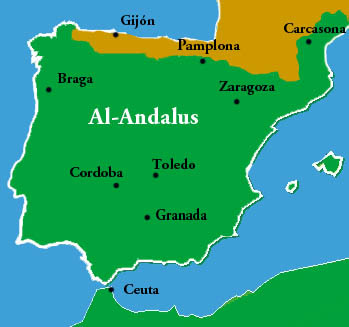 Following the conquest, al-Andalus was divided into five administrative areas roughly corresponding to Andalusia, Galicia and Lusitania, Castile and Léon, Aragon and Catalonia, and Septimania. With Narbonne and its port secure, Arab mariners were now masters of the Western Mediterranean. The Moors swiftly subdued the largely unresisting cities, still controlled by their Visigoth counts: taking Alet and Béziers, Agde, Lodève, Maguelonne and Nîmes. By 721 Al-Samh was reinforced and ready to lay siege to Toulouse, a possession that would open up Aquitaine to him. His plans were overthrown in the disastrous Battle of Toulouse (721), with immense losses, in which al-Samh was so seriously wounded that he died soon afterwards at Narbonne. Arab forces based in Narbonne and easily resupplied by sea, struck eastwards in the 720s, penetrating as far as Autun (725). In 731, the Berber wali of Narbonne and the region of Cerdagne, Uthman ibn Naissa, called "Munuza" by the Franks, who was recently linked by marriage to duke Eudes (or Odo) of Aquitaine, revolted against Córdoba, and was defeated and killed. In October of 732, an Arab force under Abdul Rahman Al Ghafiqi encountered Charles Martel between Tours and Poitiers, and was defeated. This "Battle of Tours" (also called the Battle of Poitiers) is celebrated in popular Christian history and traditionally credited with stopping the Moorish advance in Europe. Franks had been expanding southward since the fifth century. By the eighth century they were probing as far south as the Visigothic Aquitaine and Toulousain, and Moorish Septimania. The territory round Toulouse was taken by the Franks in 732 following the "Battle of Tours". Pippin III then directed his attention to Narbonne, but the city held firm in 737, defended by Goths and Jews as well as Moors under the command of its governor Yusuf, 'Abd er-Rahman's heir. Around 747 the government of Septimania (and the Upper Mark, from the Pyrenees to the Ebro River) was given to Aumar ben Aumar. In 752 the Gothic counts of Nîmes, Melguelh, Agde and Béziers refused allegiance to the Emir at Córdoba and declared their loyalty to the Frankish king. These Gothic counts along with Franks then began to besiege Narbonne. Narbonne resisted but attacks continued and Narbonne capitulated in 759. The county was granted to Miló who had previously been the count in Muslim times. The Roussillon was then taken by the Franks in 760. In 767, after fighting Waifred of Aquitaine, the Franks took Albi, Rouergue, Gévaudan, and the city of Toulouse. The following year, in 777 the wali of Barcelona (Sulayman al-Arabi), and the wali of Huesca (Abu Taur), and the wali of Zaragoza. (Husayn), offered their submission to Charlemagne. When Charlemagne invaded the Upper Mark in 778, Husayn refused allegiance and he had to retire. In the Pyrenees , the Basques defeated his forces in Roncesvalles (August 15, 778). The Frankish king found Septimania and the borderlands so devastated and depopulated by warfare, with the inhabitants hiding in the mountains, that he made grants of land that were some of the earliest identifiable Frankish fiefs to Visigothic and other refugees. Charlemagne also founded several monasteries in Septimania, which doubled as fortresses around which the people gathered for protection. Beyond Septimania to the south Charlemagne established the Spanish Marches on the borderlands of his empire. The territory passed to Louis, king in Aquitaine, but it was in practice governed by Frankish margraves of Septimania, later (from 817) the dukes of Septimania. The Frankish noble Bernat of Gothia (aka Bernat of Septimania) was the ruler of these lands from 826 to 832. His career characterised the turbulent 9th century in Septimania. His appointment as Count of Barcelona in 826 occasioned a general uprising of the Catalan lords at this intrusion of Frankish power. For suppressing Berenguer of Toulouse and the Catalans, Louis the Pious rewarded Bernat with a series of counties, which roughly delimit 9th century Septimania: Narbonne, Béziers, Agde, Magalona, Nîmes and Uzès. Rising against Charles the Bald in 843, Bernard was apprehended at Toulouse and beheaded in 844. By the end of the ninth century the Franks were calling Septimania Gothia or the Gothic march (marca Gothica). Septimania became known as Gothia after the reign of Charlemagne. It retained these two names while it was ruled by the Counts of Toulouse during early part of the Middle Ages, but the southern part became more familiar as Roussillon and the west became known as Foix, and the name "Gothia" (along with the older name "Septimania") faded away during the 10th century, except as a traditional designation as the region fractured into smaller feudal entities, which sometimes retained Carolingian titles, but lost their Carolingian character, as the culture of Septimania evolved into the culture of Languedoc. The name was used because the area was populated by a higher concentration of Goths than in surrounding regions. The rulers of this area, when joined with several counties, were titled the Marquesses of Gothia or the Dukes of Septimania. As a march of the Carolingian Empire, and then of West Francia as the empire fractured, Septimania become increasingly culturally and politically separate from France and its central royal government. The region was heavily influenced by the Toulousain, Provence, and Catalonia and was part of the cultural and linguistic region sometimes called Occitania. Although Occitania was never ruled as a unified state it shared much in common (language, food, architecture, culture, and so on). Much of the area was ruled by the Dukes of Aquitaine to the West and the Counts of Toulouse to the East, both of whom played of the neighbouring powers against each other, notably the Counts of Barcelona (later Kings of Aragon), the Kings of England, the Kings of France and the Holy Roman Emperor. The Counts of Toulouse (who were also Dukes of Narbonne) also had to contend with other local powers, most notably the Counts of Carcassonne and Beziers , and later the Viscounts of Carcassonne and Beziers, and Counts of Foix. Under the Ramondine Counts of Toulouse the area knew its golden age. Rulers were educated, tolerant and liberal. Jews and other minorities enjoyed ordinary civil rights. Occitan became the first post-classical literary language of Europe. The culture of the Troubadours was borne and flourished, as did a sophisticated world-view characterised by "paratge". Lay learning was encouraged, the extensive corruption of the Church was widely ridiculed. Ridiculing the Church and refusing to pay tithes had consequences. In the early thirteenth century the area was devastated by a Holy Crusade called by the Pope. The high culture of central Occitania was destroyed by French barbarian invaders and Church Inquisitors. Later in the thirteenth century the area would be annexed by France. You can read about this tragedy by clicking here to open a new page on the Cathar Crusade. Septimania had became known as Gothia after the reign of Charlemagne. It retained these two names while it was ruled by the Counts of Toulouse during early part of the Middle Ages, but the southern part became more familiar as Roussillon and the west became known as Foix, and the name "Gothia" along with the older name "Septimania" faded away during the 10th century, except as a traditional designation as the region fractured into smaller feudal entities, which sometimes retained Carolingian titles, but lost their Carolingian character, as the culture of Septimania evolved into the culture of Languedoc. The French referred to Septimania and to Occitania as the Languedoc, the area where a distinct language was spoken, a literary language derived from Latin, which at the time was called Roman but is now called Occitan, or by the name of one of its dialects, Provençal. In 1272 the lands of the Counts of Toulouse were annexed to France under the terms of the Treaty of Meaux. The term Languedoc originally referred to the Occitan language - the language in which the word for "yes" was "Oc". The Langue d'Oc was the "tong of oc". Later the term was extended to area where Occitan was spoken, and the word is still used in both ways today. Under the Treaty of Meaux in 1229 the Languedoc (Occitan: Lengadòc) became a Province of France. Its capital city was Toulouse, now in Midi-Pyrénées. It had an area of approximately 42,700 km² (16,490 sq. miles). The traditional provinces of the kingdom of France were not formally defined. A province was simply a territory of common traditions and customs, but it had no political organisation. Today, when people refer to the old provinces of France, they actually refer to the "gouvernements" as they existed in 1789. Gouvernements were military regions established in the middle of the 16th century whose territories matched those of the traditional provinces. However, in some cases, small provinces had been merged with a large one into a single gouvernement, so gouvernements are not exactly the same as the traditional provinces. the province of Rouergue (now département of Aveyron), both to the Northwest of Languedoc. the northern half of Provence. After the French conquest the entire county was dismantled, the central part of it being now called Languedoc. The gouvernement of Languedoc was created in the middle of the 16th century. In addition to Languedoc proper, it also included the three small provinces of Gévaudan, Velay, and Vivarais (in its entirety), these three provinces being to the northeast of Languedoc. Some people also consider that the region around Albi was a traditional province, called Albigeois (now département of Tarn), although it is most often considered as being part of Languedoc proper. The provinces of Quercy and Rouergue, despite their old ties with Toulouse, were not incorporated into the gouvernement of Languedoc, instead being attached to the gouvernement of Guienne and its far-away capital Bordeaux. This decision was probably intentional, to avoid reviving the independently-spirited county of Toulouse. The Province of Languedoc covered an area of approximately 42,700 km² (16,490 sq. miles), roughly the region between the Rhône River (border with Provence) and the Garonne River (border with Gascony), extending northwards to the Cévennes and the Massif Central (border with Auvergne). The governors of Languedoc resided in Pézenas, on the Mediterranean coast, away from Toulouse but close to Montpellier. In time they had increased their power well beyond military matters, and had become the l administrators and executive power of the province, a trend seen in the other gouvernements of France, but particularly acute in Languedoc. In the Languedoc the Duke of Montmorency, governor of Languedoc, openly rebelled against the king, was defeated and beheaded in Toulouse in 1632 by the order of Richelieu. The kings of France became fearful of the power of the governors, so after King Louis XIV (the Sun King) they had to reside in Versailles and were forbidden to enter the territory of their gouvernement. Thus the gouvernements became hollow structures, but they still carried a sense of the old provinces, and so their names and limits have remained popular until today. For administrative purposes, Languedoc was divided in two généralités, the généralité of Toulouse and the généralité of Montpellier, the combined territory of the two generalities exactly matching that of the gouvernement of Languedoc. At the head of a generality was an intendant, but in the case of Languedoc there was only one intendant responsible for both generalities, and he was often referred to as the intendant of Languedoc, even though technically speaking he was in fact the intendant of the generality of Toulouse and intendant of the generality of Montpellier. The generality of Toulouse is also referred to as Upper Languedoc (Haut-Languedoc), while the generality of Montpellier, down to the level of the sea, is referred to as Lower Languedoc (Bas-Languedoc). The intendants of Languedoc resided in Montpellier, and they had a sub-delegate in Toulouse. Montpellier was chosen specifically to diminish the power of Toulouse, which symbolised the old spirit of independence of the county of Toulouse, and whose parlement was very influential. The intendants replaced the governors as administrators of Languedoc, but appointed and dismissed at will by the king, they were no threat to the central state in Versailles. By 1789 they were the most important element of the local administration of the kingdom. For judicial and legislative matters, Languedoc was overseen by the Parlement of Toulouse, founded in the middle of the 15th century. It was the first parlement created outside of Paris by the kings of France in order to be the equivalent of the Parlement of Paris in the faraway southern territories of the kingdom. The jurisdiction of the Parlement of Toulouse included the whole of the territory of the gouvernement of Languedoc, but it also included the province of Rouergue, most of the province of Quercy, and a part of Gascony. The Parlement of Toulouse was the supreme court of justice for this vast area of France, the court of last resort whose rulings could not be appealed, not even to the Parlement of Paris. The Parlement of Toulouse could also create case law through its decisions, as well as interpret the law. It was also in charge of registering new royal edicts and laws, and could decide to block them if it found them to be in contravention with the liberties and laws of Languedoc. For purposes of taxation, Languedoc was ruled by the States of Languedoc, whose jurisdiction included only Languedoc proper (and Albigeois), but not Gévaudan, Velay, and Vivarais, which kept each their own provincial states until 1789. Languedoc proper was one of the very few provinces of France which had the privilege to decide over tax matters, the kings of France having suppressed the provincial states in most other provinces of the kingdom. This was a special favour from the kings to ensure that an independently-spirited region faraway from Versailles would remain faithful to the central state. The States of Languedoc met in many different cities, and for some time they established themselves in Pézenas, but in the 18th century they were relocated definitively to Montpellier, where they met once a year, until 1789. For religious purposes, Languedoc was divided into a number of ecclesiastical provinces. Resulting from this intricate entanglement of administrations and jurisdictions so typical of France before the French Revolution, it is hard to say which city was the capital city of Languedoc. Toulouse and Montpellier both often claim to be the capital of Languedoc. As a matter of fact, in the 18th century the monarchy clearly favouredMontpellier, a city much smaller than Toulouse, and with less history and memories attached to it than the ancient metropolis of Toulouse, of which the kings of France were always fearful. However, most people consider that Toulouse is the real capital city of the province of Languedoc, due to its old status as centre of the county of Toulouse, and due to the mighty power of its parlement. On maps (both ancient and modern) showing the provinces of France in 1789 (or rather the gouvernements), Toulouse is always marked as the capital city of Languedoc. 24.8% of its former territory lies in the Midi-Pyrénées région, capital city Toulouse, covering the département of Tarn, as well as the eastern half of Haute-Garonne, the southeast of Tarn-et-Garonne, and the Northwest and Northeast of Ariège, which account for 23.4% of the territory of Midi-Pyrénées. The remaining 76.6% is made of Quercy and Rouergue, as well as the province of County of Foix (which had been a vassal of the county of Toulouse in the Middle Ages), several small provinces of the Pyrenees mountains, and a large part of Gascony. The population of the former province of Languedoc is currently the fastest-growing in France, and also among the fastest-growing in Europe, as an increasing flow of people from northern France and the north of Europe relocating to the sunbelt of Europe, in which Languedoc is located. Growth is particularly strong in the metropolitan areas of Toulouse and Montpellier, which are the two fastest growing metropolitan areas in Europe at the moment. However, the interior of Languedoc is still losing inhabitants, which increases the difference of density. Population of the coast of Languedoc as well as the region of Toulouse is young, educated, and affluent, whereas in the interior the population tends to be much older, with significantly lower incomes, and with a lower percentage of high school and especially college graduates. Languedoc-Roussillon (Occitan: Lengadòc-Rosselhon; Catalan: Llenguadoc-Rosselló) is one of the 26 regions of France. It comprises five departments, and borders the other French regions of Provence-Alpes-Côte d'Azur, Rhône-Alpes, Auvergne, Midi-Pyrénées on the one side, and Spain, Andorra and the Mediterranean Sea on the other side. 68.7% of Languedoc-Roussillon was formerly part the province of Languedoc: the departments of Aude, Gard, Hérault the extreme south and extreme east of Lozère, and the extreme north of Pyrénées-Orientales. The former province of Languedoc also extends over the Midi-Pyrénées region, including the old capital of Languedoc Toulouse. 17.9% of Languedoc-Roussillon was formerly the province of Gévaudan: Lozère department. A small part of the former Gévaudan lies inside the current Auvergne region. Gévaudan is often considered to be a sub-province inside the province of Languedoc, in which case Languedoc would account for 86.6% of Languedoc-Roussillon. 13.4% of Languedoc-Roussillon, located in the southernmost part of the region, is a collection of five historical Catalan pays: Roussillon, Vallespir, Conflent, Capcir, and Cerdagne, all of which are in turn included -east to west- in the Pyrénées-Orientales département. These pays were part of the Ancient Regime province of Roussillon, owning its name to the largest and most populous of the five pays, Roussillon. "Province of Roussillon and adjacent lands of Cerdagne" was indeed the name that was officially used after the area became French in 1659, based on the historical division of the five pays between the county of Roussillon (Roussillon and Vallespir) and the county of Cerdagne (Cerdagne, Capcir, and Conflent). Llívia is a town of Cerdanya, province of Girona, Catalonia, Spain, that forms a Spanish exclave surrounded by French territory (Pyrénées-Orientales département). At the regional elections in March 2004, the socialist mayor of Montpellier Georges Frêche, a maverick in French politics, conquered the region, defeating its center-right president. Since then, Georges Frêche has embarked on a complete overhaul of the region and its institutions. The flag of the region, which displayed the cross of Languedoc as well as the Flag of Roussillon (the "Senyera"), was changed for a new nondescript flag with no reference to the old provinces, except in terms of the colours (red and yellow), which are the colours of both Languedoc and all the territories from the former Crown of Aragon. Frêche also wanted to change the name of the region, wishing to erase its duality (Languedoc vs. Roussillon) and strengthen its unity. Thus, he wanted to rename the region "Septimanie" (Septimania), the name created by the Romans at the end of the Roman Empire for the coastal area corresponding quite well to present day Languedoc-Roussillon (including Roussillon, but not including Gévaudan), and used in the early Middle Ages for the area. A strong opposition of the population led to Georges Frêche giving up on his idea. Catalan nationalists in Roussillon would like the Pyrénées-Orientales department to secede from Languedoc-Roussillon and become a region in its own right, under the proposed name of "Catalunya Nord" (Northern Catalonia). On the other hand there are some who would like to merge the Languedoc-Roussillon and Midi-Pyrénées regions, reunifying the old province of Languedoc, and creating a large region. Prior to the 1960s, Occitan and Catalan were the dominant languages of the area. Occitan literature - still sometimes called Provençal literature - is a body of texts written in Occitan in what is nowadays the South of France. It originated in the poetry of the eleventh- and twelfth- century Troubadours, and inspired the rise of vernacular literature throughout medieval Europe. Music. Aimeric de Peguilhan, Giraut de Bornelh and Bertran de Born were major influences in troubadour composition, in the High Middle Ages. The troubadour tradition is associated with originating from the region. The Romantic music composer Déodat de Séverac was born in the region, and, following his schooling in Paris, he returned to the region to compose. He sought to incorporate the music indigenous to the area in his compositions. Wine. The Languedoc-Roussillon region is a major wine producing area - the largest in the world - dominated by 740,300 acres (2,996 km2) of vineyards, three times the area of all the vineyards in Bordeaux. The region has been an important wine making centre for centuries. Grapevines are said to have existed in the South of France since the Pliocene period - before the existence of Homo sapiens. The first vineyards of Gaul developed around two towns: Béziers and Narbonne. The Mediterranean climate and plentiful land with soil ranging from rocky sand to thick clay was very suitable for the production of wine, and it is estimated that one in ten bottles of the world's wine was produced in this region during the 20th century. The region is the largest contributor to the European Union's glut of wine known as the wine lake. Sud de France. The Languedoc-Roussillon region has adopted a marque to help market its products, in particular, but not limited to, wine. The 'Sud de France' (Southern France) marque was adopted in 2006 to help customers abroad not familiar with the Appellation system to recognise those wines that originated in the L-R area, but the marque is also used for other products, some of which include cheeses, olive oils and pies. The Frankish king Clovis defeated the Visigoths in the Battle of Vouillé. Afterwards, the child-king Amalaric was carried for safety into the Iberian Peninsula. Aquitania passed into the hands of the Franks, and Septimania, with other Visigothic territories in Gaul, was ruled by Amalaric's maternal grandfather, Theodoric the Great. Theodoric the Great created the first kingdom of Septimania, retaining its traditional capital at Narbonne. He appointed as his regent an Ostrogothic nobleman named Theudis. The young Amalaric was proclaimed king. Theodoric died. Amalaric assumed full royal power in the Iberian Peninsula and Septimania, relinquishing Provence to his cousin Athalaric. He married Clotilda, daughter of Clovis, but found, as other royal husbands of Merovingian princesses found, that the entanglement brought on him the penalty of a Frankish invasion. Amalaric lost his life in the Frankish invasion, and Arian Visigothic Septimania was the last part of Gaul to remain in Visigothic hands. Prince Theudebert son of Theuderic of Austrasia (Merovingian Frankish not Gothic) invaded Septimania in concert with Prince Gunthar son of King Chlothar. Gunthar stopped at Rodez and did not invade Septimania. Theudebert took and held the country as far as Béziers and Carbiriers from which he took the woman Deuteria as a wife. Theudebert and his half brother Childebert invaded Spain as far as Saragossa 534-538. At some point soon after this, the Visigoths regained the territory they had lost in Theudebert's invasion. Merovingian King of Burgundy Guntram raised a force to invade Septimania as a prelude to conquest of Spain. His forces plundered from Nîmes to Carcassonne (where the Frankish Count Terentiolus of Limoges was killed) but were unable to take the walled cities. Visigothic Prince Recared came in response from Spain to Narbonne and as far as Nîmes and invaded nearby Frankish territories as far as Tolosa for plunder and to punish the Franks for the invasion (Gregory of Tours Book VIII 30-31 and 38). Frankish rebel Dukes Desiderius and Austrovald at that time in control of Tolosa raised an army and attacked Carcassonne. Desiderius was defeated and killed and Austrovald retreated with his for Tolosa (Gregory of Tours Book VIII 44). Septimania came under Catholic Rule in 587 with the conversion of Recared, who had become the King of the Visigoths in 586 with his father, Leovigild's death. At that time Arian Bishop Athaloc and Counts Granista and Wildigern revolted against Recared in Septimania but were defeated (Gregory of Tours Book IX 15 and John of Biclar) Most of the Christian population of the province were already Catholic and Arian Christians largely converted with the death of Athaloc soon after Recared's conversion. Merovingian King of Burgundy Guntram again tried to invade Septimania sending Austrovald to Carcassonne and Boso and Antestius to other cities. King Recared sent General Claudius who defeated the Franks and preserved the territory of Septimania under Visigothic Rule. Al-Samh set up his capital at Narbonne, which the Moors called Arb?na. He offered the still largely Arian inhabitants generous terms. By now Al-Samh was reinforced and ready to lay siege to Toulouse, a possession that would open up Aquitaine to him on the same terms as Septimania. But his plans were overthrown in the disastrous Battle of Toulouse (721), with immense losses, in which al-Samh was so seriously wounded that he soon died at Narbonne. Arab forces soundly based in Narbonne and easily resupplied by sea, struck eastwards. The Berber wali of Narbonne and the region of Cerdanya, Uthman ibn Naissa, called "Munuza" by the Franks, who was recently linked by marriage to duke Eudes of Aquitaine, revolted against Córdoba, and was defeated and killed. October: An Islamic invasion force made up primarily of Berber and Arab cavalry under Abdul Rahman Al Ghafiqi encountered Charles Martel and his veteran Frankish army between Tours and Poitiers and was defeated, and Abd er-Rahman was killed, at what the majority of historians consider the macrohistorical "Battle of Tours" that stopped the Moorish advance. The Franks took the territory round Toulouse. Charles Martel directed his attention to Narbonne. Charles Martel destroyed Arles, Avignon, and Nîmes, but unsuccessfully attacked Narbonne, which was defended by its Goths, and Jews under the command of its governor Yusuf, 'Abd er-Rahman's heir. Having crushed the relief force at the River Berre, he left Narbonne isolated. around 747: The government of the Septimania region (and the Upper Mark, from the Pyrenees to the river Ebro) was given to Aumar Ben Aumar. 752: The Gothic counts of Nîmes, Melguelh, Agde and Béziers refused allegiance to the emir at Córdoba and declared their loyalty to the Frankish king. The count of Nîmes, Ansemund, had some authority over the remaining counts. The Gothic counts and the Franks then began to besiege Narbonne, where Miló was probably the count (as successor of the count Gilbert), but Narbonne resisted. An anti-Frank reaction, led by Ermeniard, killed Ansemund, but the uprising was without success and Radulf was designated new count by the Frankish court. About 755: Abd al-Rahman Ben Uqba replaced Aumar Ben Aumar. 759: Charles Martel's son, Pippin the Younger besiegedNarbonne, which capitulated. The county was granted to Miló, who was the Gothic count in Muslim times. 760: The Franks took the region of Roussillon. 767: After the fight against Waifred of Aquitaine, Albi, Rouergue, Gévaudan, and the city of Toulouse were conquered. 777: The wali of Barcelona, Sulayman al-Arabi, and the wali of Huesca, Abu Taur, offered their submission to Charlemagne and also the submission of Husayn, wali of Zaragoza. 778: Charlemagne invaded the Upper Mark. Husayn refused allegiance and Charlemagne had to retreat. 778: August 15: In the Pyrenees , the Basques defeated Charlemagne's forces in the Roncesvalles. Charlemagne found Septimania and the borderlands so devastated and depopulated by warfare, with the inhabitants hiding among the mountains, that he made grants of land that were some of the earliest identifiable fiefs to Visigothic and other refugees. He also founded several monasteries in Septimania, around which the people gathered for protection. Beyond Septimania to the south Charlemagne established the Hispanic Marches in the borderlands of his empire. Septimania passed to Louis, king in Aquitaine, but it was governed by Frankish margraves and then dukes (from 817) of Septimania. 826: The Frankish noble Bernat of Septimania (also, Bernat of Gothia) became ruler of Septimania and the Hispanic Marches and ruled them until 832. His career characterised the turbulent 9th century in Septimania. His appointment as Count of Barcelona in 826 occasioned a general uprising of the Catalan lords at this intrusion of Frankish power. For suppressing Berenguer of Toulouse and the Catalans, Louis the Pious rewarded Bernat with a series of counties, which roughly delimit 9th century Septimania: Narbonne, Béziers, Agde, Magalona, Nîmes and Uzès. 843: Bernard rose against Charles the Bald. 844: Bernard was apprehended at Toulouse and beheaded.